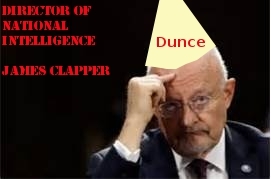 Finnerty's Blog: Subjunctive Intelligence Community: Just because one calls themselves an intelligence service, doesn't make them "intelligent"
Subjunctive Intelligence Community: Just because one calls themselves an intelligence service, doesn't make them "intelligent"
We are told that the actions that are being taken by the American intelligence community are both Constitutional and effective; to believe either would ignore recent American history and the public statements from the alphabet soup that makes up the American intelligence community. Faisal Shahzad and Najibullah Zazi, failed Times Square bomber and and NYC subway bomber respectively, both were legitimate terrorists that were unsuccessful but not due to American intelligence agencies instead due to vigilant street vendor (Shahzad) and interrogation of the Al-Qaeda recruiter Bryant Neal Vinas (Zazi). I make this distinction due to all the other instances that FBI, NSA, and CIA have had their fingers involved in very dicey cases; such instances were all claimed to be heroic uses of the intelligence community in protecting our security while plausibly trampling on our rights. Jose Padilla could have transported the material into the heartland of America without setting off Geiger counters of customs agents. Jose Padilla's travels to Egypt, Saudi Arabia, Afghanistan, Pakistan, and Iraq, and "enhanced interrogation" of Abu Zubaydah that initiated the intelligence community to set sights on Jose Padilla prior his return to America (empty handed, as in no fissionable material) and his arrest at Chicago's O'Hare International Airport-- not any actual attempt to attain the material to carry off his Jihadist dreams. 2006: Liberty City Seven, 7 Americans in Miami accused of planning to bomb Chicago's Sears Tower quite possibly taking down the tallest building (at the time) in America. Our intelligence community saved America from that horror. Any of the seven had any experience with any explosives or access to explosives. The persons who were the impetus of the entire idea had pushed them harder to go through with it, but then they would not have been very good confidential witnesses. Both confidential witnesses hadn't negotiated deals to avoid prison time and hadn't at the direction of FBI told the Liberty City Seven that they being of Middle Eastern descendant had connections with Al-Qaeda. So had any involved actually been terrorists involved. Charles James Stewart, the only named paid-informant in the indictment, wasn't the only person in the "conspiracy" that had been to Chicago. 2009: 'New York City Bomb Plot' where 4 Newburgh men who described themselves as Black-Muslims plotted to attack Bronx synagogues and shoot down military aircraft from a nearby air force base. Our intelligence community saved America from that horror. FBI informant, Shahed Hussain, hadn't been trolling Masjid al-Ikhlas for strangers interested in Jahid. It wasn't a fact that the only weapon that the four had access to was the handgun James Cromitie bought from a street gang member and the impotent props provide by the FBI. The unconstitutional overreach the American intelligence community has already had a survey to find out what the American public thinks of it. The survey asked if it was acceptable to track phone calls and monitor emails and internet of Americans *IF* it *MIGHT* prevent terror attacks. All instances had a slight majority of acceptance, but the use of the implausible subjunctive of *IF* takes away any real credibility to the response. Would the same 56% of respondents find it acceptable *IF* the government intrusion had less than a 1% chance of success? Or would acceptance drop more so *IF* it were known that internet monitoring and cell phone tracking are wholly useless when targets are thoroughly trained by Al-Qaeda such as Faisal Shahzad and Najibullah Zazi that depend on the face-to-face communication rather than the neophytes that are hoodwinked by FBI paid informants? Demarcation from tracking all your phone calls (sans content) and then retroactively go back to listening to the calls after getting a warrant from the rubber stamp FISA court seems to disappear when authorities are asked 'does our intelligence community listen to our phone calls?' *IF* the virtual dragnet was effective then why wouldn't the alphabet soup prevent the Boston Marathon Bombing? *IF* the virtual dragnet was effective then why wouldn't the alphabet soup prevent the shoe bomber Richard Reid not a fellow airline passenger? *IF* the virtual dragnet was effective then why wouldn't the alphabet soup prevent the underwear bomber Umar Farouk Abdulmutallab not a fellow airline passenger? Why have PRISM and phone tracking of all Americans when it doesn't protect America and isn't within Constitutional restrictions of the fourth amendment? In my humble opinion, NSA and the other intelligence agencies have have wholly gone rogue and are no longer accountable to our elected officials in government therefore should be dismantled immediately.